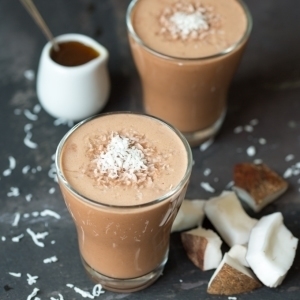 Malted Coconut HOT Smoothie – a quick and healthy hot smoothie for a cold day. 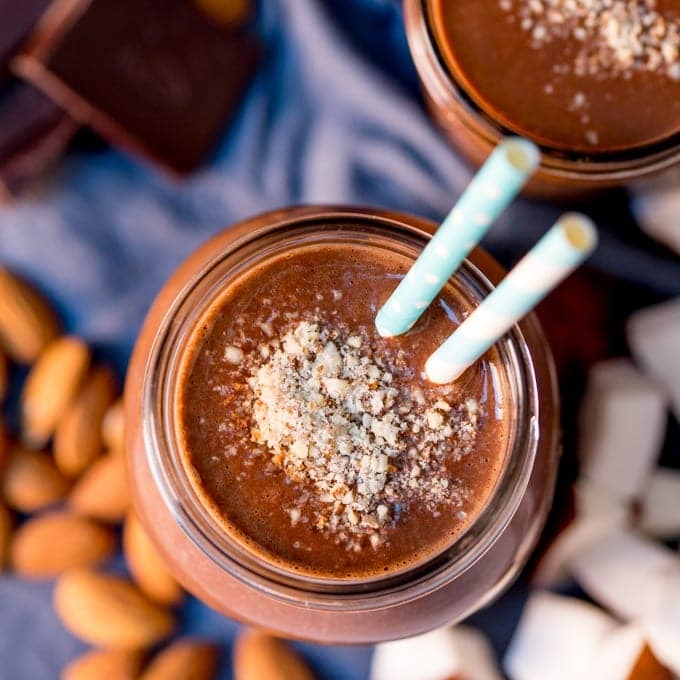 Hazelnut milk gives the smoothie it’s creaminess, without being too sweet, the fresh coconut and a little cocoa powder – which complement each other and the rest of the ingredients perfectly. I know we’re in November now, so I should’t really include this in my October Hot Smoothie Saturday series, but I couldn’t resist including one more Malted Coconut Hot Smoothie bonus smoothie. 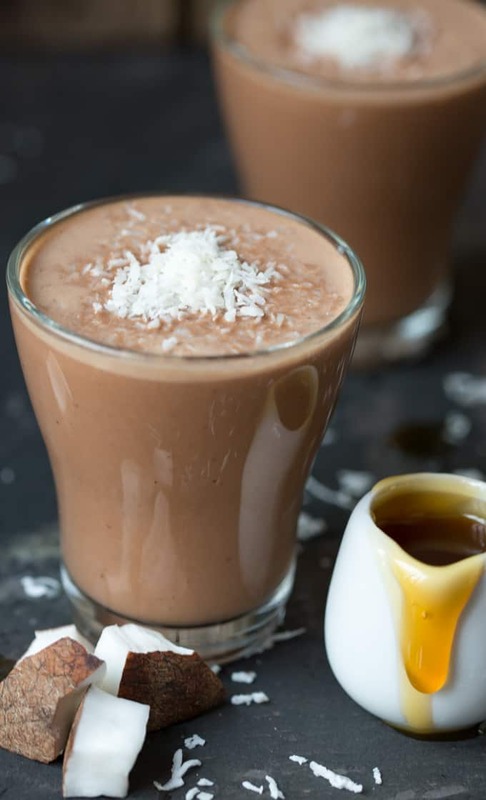 This Malted Coconut Hot Smoothie has got a couple of unusual ingredients in it, but if you make a lot a of smoothies, you may already have them in your cupboard. I was looking for a malty drink, but nothing too reminiscent of Horlicks or Ovaltine. 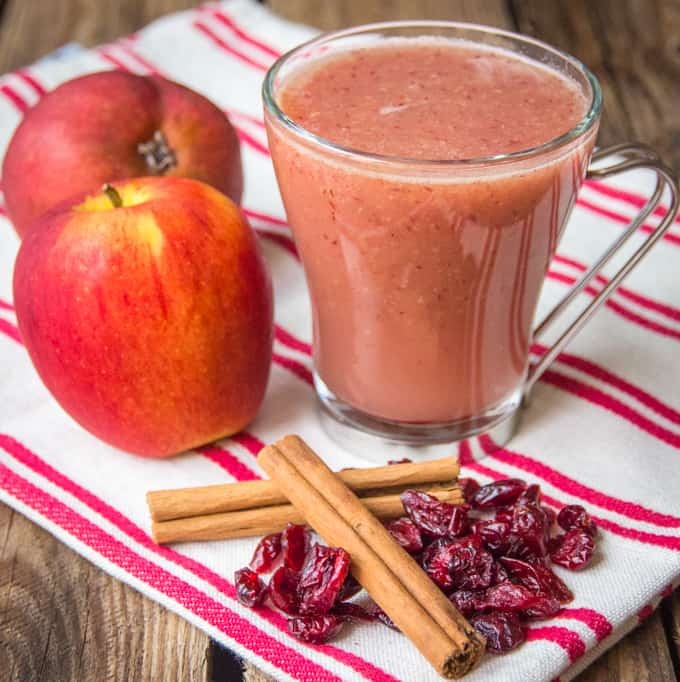 After all, this smoothie is supposed to warm and energise you for the day – not send you back to bed. So I chose to use rice malt syrup to give that malty flavour. You should find it in the bigger supermarkets or health stores. It’s pretty inexpensive, and it has the consistency of regular syrup, but it releases energy a lot slower than sugar or syrup. It has a lovely, light and sweet-but-not-too-sweet malty flavour. I’ve also included maca powder. This is optional, but it does add slightly to the malty flavour, whilst being high in vitamins and minerals. Again you can find this in larger supermarkets and health stores. 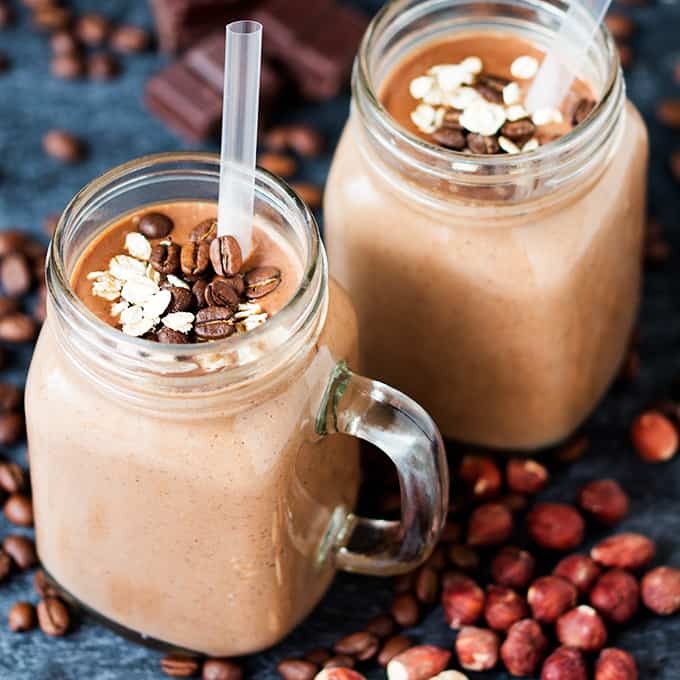 Hazelnut milk gives the smoothie it’s creaminess, without being too sweet (you can replace with almond milk if you prefer). Then there’s the fresh coconut and a little cocoa powder – which complement each other and the rest of the ingredients perfectly. So, definitely not your usual run-of-the-mill smoothie ingredient list, but a great breakfast that will satisfy your hunger, without being too heavy. Just before I carry on with the recipe, a reminder of the words of warning from my previous hot smoothie posts. Don’t fill your smoothie maker up with boiling liquid. It’s either going to shatter the glass (if you have a glass jug) or it’s going to come wushing out with a tonne of pressure when you open the lid after whizzing things up. Check your smoothie maker or blender can take warm or hot liquids. 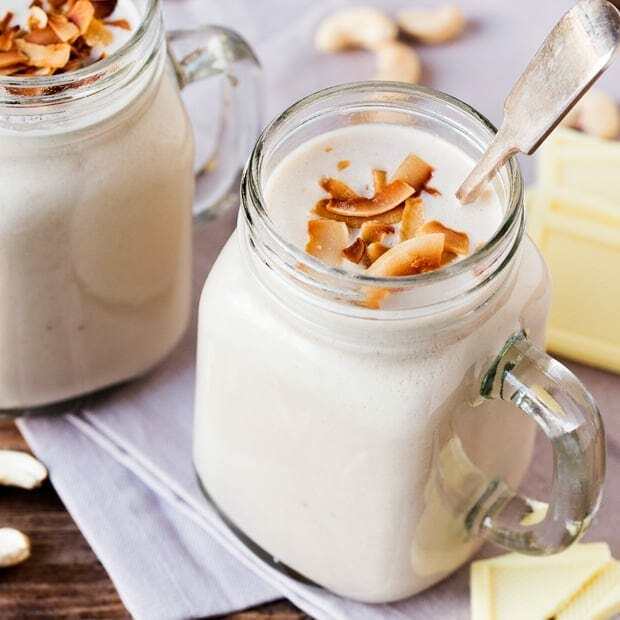 This Malted Coconut Hot Smoothie recipe calls for a little of the warm hazelnut milk to be mixed with cold water before blending. Then add the rest of the hot hazelnut milk at the end. Heat the hazelnut milk in a pan or the microwave until warm. Add the coconut, cocoa, malt extract, maca powder, water and approx. a fifth of the hazelnut milk to your smoothie maker or blender. Add in an extra splash of cold water if you think the liquid is too warm (see warning above about hot liquids and smoothie makers). Blend on high for a minute until the coconut milk has been completely incorporated. Whilst it's blending, further heat the rest of the hazelnut milk until hot, but not boiling. Another wonderful hot smoothie for these chilly early morning starts. This looks absolutely heavenly…I’d love to make this for breakfast this weekend. I’ve never experimented with liquid rice malt syrup before. Is it much different in taste than pure maple syrup? Oh god I can imagine how good this smoothie must have tasted.. the combination of coconut, hazelnut and chocolate is wickedly delicious. 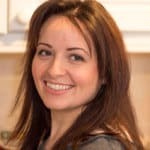 Definitely a recipe I will be making, thanks for sharing it!